I've had a good few requests to feature more budget friendly skin care and hand on heart I do rate the Una Brennan Super Facialist range to be brilliant regardless of the price point. The products are well priced, smell great, easy to source (in the UK) and of course work. We all need a good eye cream in my eyes (pun fully intended) you are never too young to begin to protect the delicate undereye area as long as you use something suited to your needs and this is just the thing for those not looking for an anti-ageing formula. Una Brennan Super Facialist Super Facialist Vitamin C+ Dark Circles Eye Cream is a light but hydrating formula that quickly sinks into the skin making it perfect for morning applications before make-up. Yes the concept of this particular eye cream is to banish dark circles which it does over time (around 3 weeks to a month) but I deem it to be a great all round eye cream and perfectly suited to those in their teens to early twenties who are looking out to start with an eye cream. However don't get me wrong this is suited to all ages as it hydrates, smooths and soothes all the while helping create a light radiance effect to the eye area - I liken it somewhat to The Body Shop's Vitamin E Eye Cream in that aspect. In my opinion if you have time to wipe a cotton pad soaked in micellar water all over your face in the evening before doing a real cleanse you have time to do a proper pre-cleanse with an oil as it takes as much time and effort but garners better results. Do I double cleanse daily? Nah only when I have been wearing make-up otherwise it seems a bit fruitless. Basically the double cleanse procedure is to ensure you have removed every scrap of make-up and other grime from the skin by cleansing the face twice, normally with two separate products. If you are thinking of embarking on a dual cleanse process then you can do much worse than the Una Brennan Superfacialist Rose Miracle Makeover Facial Oil - a light silky oil that quickly and effectively removes the bulk of your make-up in one quick step. You apply this rose scented oil to dry skin before dampening to form a milky emulsion. In my opinion it is one of the easier skin oils to remove making it great for those in a hurry as you don't have to worry too much about leaving behind residue on the skin. My only compliant would be that it is very scented meaning it could irritate sensitive skin. The tag line for this product is "Feel like you've had a facial everyday" I wouldn't go that far as it really is a rub in, wash off type of product but I guarantee you that your skin will thank you tenfold for using this over a wet wipe! This is perhaps the best known Una Brennan product and for good reason too. As a fairly budget friendly facial oil this is pretty wonderful - it feels great on the skin, leaves the skin feeling soft and looking radiant not to mention it smells beyond wonderful (like real oranges) and is quick and easy to use. My only criticisms would be that the oil is really thick and heavy so you do have to ensure you have removed every little scrap to avoid the skin breaking out. I like to use two wet flannels when removing this oil so it is not for those in a hurry that is for sure. The plus side of this is that it does really encourage you to take care of your skin and will stop you being lazy...every silver cloud. My other problem is that so much oil gets wasted due to there not being a pump - you pour this out onto your hands, rub on dry skin and remove using warm water and a flannel. Yes it does leave my skin feeling and looking great but I won't lie the lack of convenience really puts me off using it. Again this is highly scented so may not be suited to dry skins but if you are new to the skin oil cleansing world this is a great starter product. Looking to detox your skin? This is the mask for you. Una Brennan Superfacialist Tea Flower Pore Purifying Clay Mask cleanses thoroughly to remove dirt and grime from clogged pores, dries up blemishes as well as mopping up excess oil - this is accomplished using Salicylic Acid and Dead Sea Mud. .If you have oily skin this is a mask you need in your arsenal it works similarly to Origins Clear Improvement Mask only marginally cheaper. I should point out that although it cleanses wonderfully and is great for a once a week treat this mask is not the gentlest and does tingle somewhat upon application. As it somewhat dries out the skin to control oil and banish blemishes those with dry skin may want to use this on specific areas such as the t-zone to prevent further drying out their complexion. 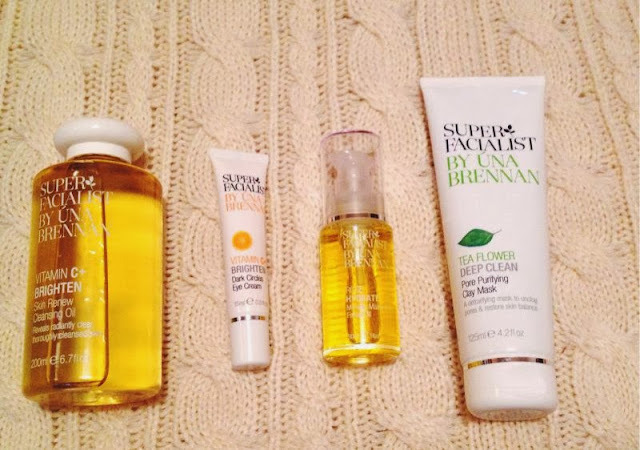 So those are my Una Brennan Super Facialist picks, what are yours? These all look like amazing products! Wish we could get this brand here in Toronto! I've read lots of rave reviews about the clay mask, so I think I might have to pop in a sneaky purchase in the new year. The eye cream sounds promising, too! I need to try some of these, I have a major skincare haul about to happen! Cant wait!! Everyone seems to have tried something from this brand, and most of them have good reviews, I have to try some of these picks! Given that the rose facial oil is in a much smaller bottle yet more expensive that the Vitamin C facial oil, I would have thought its purpose was to hydrate rather than cleanse, and that it shouldn't be washed off but used as/coupled with a moisturiser...? Also I have had the same trouble pouring out wayyy too much product out of that big bottle, so I bought a much smaller one, with pump like this one: http://www.boots.com/en/Boots-Pump-Travel-Bottle-70ml_1374035/ much, much easier to use, and perfect for when I go on holidays! The Rose Scrub is amazing too. I use it for face and body, works really well and smells amazing. I use the mask you have featured here and the rose oil which I have recently just finished up. I have considered buying the vitamin c oil however I too find myself put off by the lack of no pump, it is cheaper than the rose version though which is a positive and you get more for your money too.